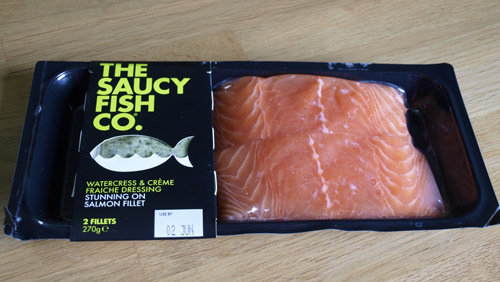 I was asked to review this recipe pack from The Saucy Fish Co. 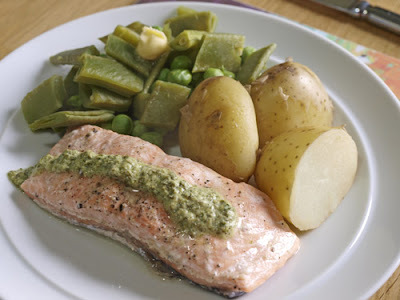 I have to say I was a little sceptical of the value when I saw that it was basically just two salmon fillets and a packet of watercress sauce for £4.00 (Tesco). However, I do enjoy salmon and it's something I often have for a quick supper. I followed the instructions and baked the salmon in the oven for 25 minutes, alternatives of pan frying or grilling were provided. I added some white wine and salt and pepper to my oven dish and covered it with foil. The sauce can be served hot or cold and you simple dip the little sachet into a mug of boiling water to heat it. Couldn't be easier and no extra pot to wash up. I served my salmon with Jersey Royal potatoes and the lovely green beans and fresh peas from my Farmison hamper. The fish was excellent, much better than the usual salmon fillets from the supermarket, it had a firm flesh and tasted very fresh. The watercress sauce was also of a high quality without any additives or processed aftertaste, although I would have liked more of it. My scepticism was unfounded and I would recommend The Saucy Fish Co. fish packs as a great way to produce a first class meal without any hassle. Let's face it, we all have days when we need that. Disclaimer: This is a sponsored post. I was not required to write a positive review and any opinion expressed is my own. Prices are correct at time of posting. I've often wondered about those - the fish usually looks lovely, glad to hear they taste good too. looks good and nice to know that they taste great and if one is ever in need of a tasty salmon dish!